NASHUA – Going as far as to allege federal Judge Brett Kavanaugh is a “dangerous” Supreme Court nominee who is “deliberately concealing” his record, U.S. Sen. Jeanne Shaheen, D-N.H., on Monday announced her formal opposition to President Donald Trump’s high court pick. Also Monday, U.S. Sen. Maggie Hassan, D-N.H., alleged Kavanaugh “promotes a partisan right-wing ideology at odds with the will of the American people” in confirming she will vote against the nominee. The mathematic march toward Kavanaugh’s confirmation at month’s end remains the same in the Senate, where Republicans hold a 51-49 edge. Senate Democrats don’t have the votes to block Kavanaugh, but that didn’t stop them from putting up a rowdy, leave-nothing-on-the-table fight during four days of Senate confirmation hearings last week, marking a new stage in the party’s resistance to Trump. From the moment that the Senate Judiciary Committee chairman gaveled in the first session last week, the proceedings were tumultuous, disrupted first by Democratic senators objecting to the rules and then by protesters shouting “Sham president, sham vote” and other chants. Senate Majority Leader Mitch McConnell, R-Ky., portrayed the Democratic Party as dominated by “unhinged” protesters and aligned with liberals calling to abolish U.S. Immigration and Customs Enforcement (ICE). The second-ranking Republican, Sen. John Cornyn of Texas, bemoaned the “mob rule” at the hearings. Democrats’ only real chance to stop Kavanaugh is if they can convince Republican U.S. Sens. Susan Collins of Maine or Lisa Murkowski of Alaska to join them in blocking the nominee. Neither Collins, nor Murkowski, have taken a formal position on Kavanaugh at this point. U.S. Sens. Joe Donnelly in Indiana or Claire McCaskill in Missouri may benefit from a court battle that energizes the Democratic base. They need heavy voter turnout in metro Indianapolis and Kansas City, Democratic strongholds, if they have any hope of carrying otherwise red states that Trump won in 2016. 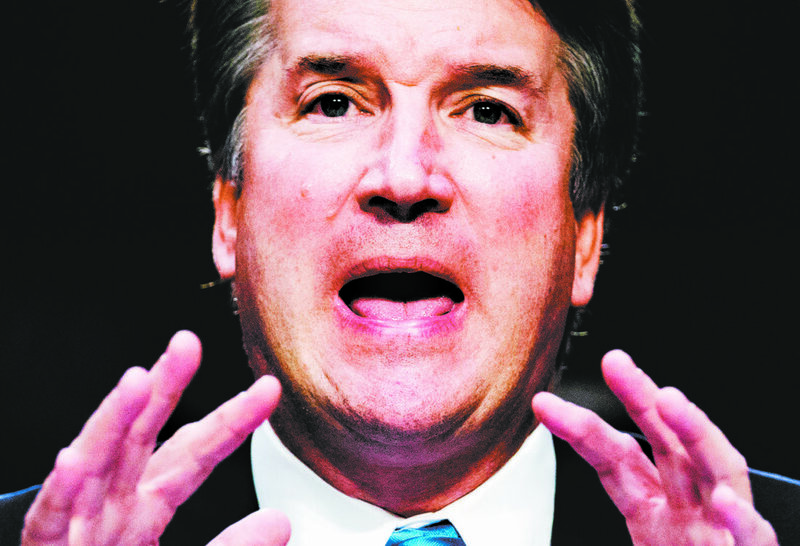 Yet the court fight might be unhelpful as some Democrats, including U.S. Sen. Heidi Heitkamp in North Dakota and U.S. Sen. Joe Manchin in West Virginia, try to appeal to the moderate Republicans and independents they need to win over. “It’s probably the last thing that Democrats running for re-election in red states want to be talking about,” said Alex Conant, a Republican strategist and former top aide to U.S. Sen. Marco Rubio, R-Fla. This does not seem to be a concern for the New Hampshire senators, however, neither of whom faces re-election this year. “What the totality of this record makes abundantly clear is that on issue after issue, Judge Kavanaugh has promoted a judicial philosophy that diminishes the rights of individuals, particularly women and people of color; puts corporations before people; and promotes a partisan right-wing ideology at odds with the will of the American people,” Hassan added. Both New Hampshire senators also opposed the nomination of now Justice Neil Gorsuch last year.